The wonderful graphic quality of this one of a kind Wari tunic fragment speaks for itself, but a careful explanation of its imagery will certainly enhance ones appreciation for this beautiful textile fragment. Please read on... Re-purposed sometime ago to create a small coca bag, this textile fragment has recently been disassembled and opened out into what is a very captivating fragment of elite Wari tapestry weaving. 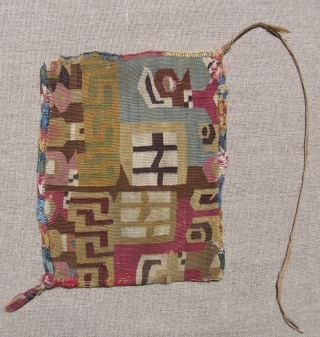 Examination of the "bag's" side binding raised the question; was this fragment actually made into a bag in ancient times? Although this is very rarely seen, it is not unheard of. In the end, it was determined that it needed to be disassembled to genuinely appreciate what it once was. 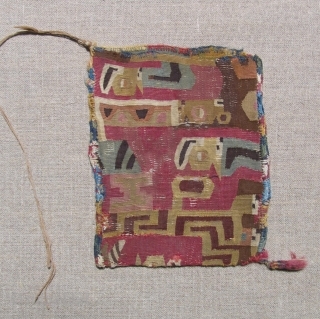 This fragment is a small portion of a highly important Wari tapestry tunic or mantle. The fineness of its weave, with at least 17 different colors including, what for a Wari textile, would be considered a prodigious use of indigo along with the special nature of its iconography all indicate that the original tunic was definitely of elite status. The imagery includes feline, snake and fish iconography. 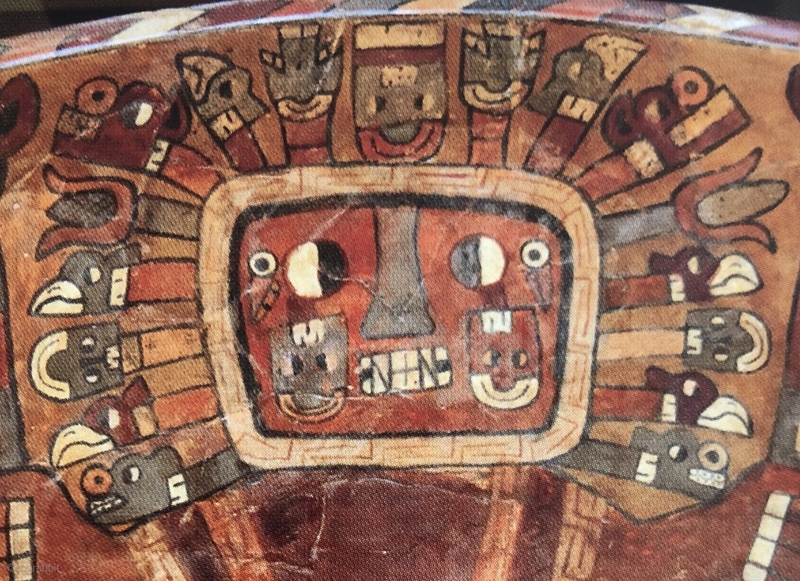 Importantly, when the textile was complete, two large profile heads with rayed appendages were depicted facing each other. Together, they would have formed a single "composite" image of a frontal-facing Solar Deity when the textile was complete. i know this is hard to visualize - even for experts, so i have included a well known Wari ceramic fragment showing the frontal facing Staff Deity for reference. Pay attention to the teeth feature of the figure on the ceramic to orient yourself to the textile's teeth feature. Also notice the fret-work border surrounding the face of the ceramic figure to better understand the textile's fret-work detail. (It is still probable that a further discussion will be necessary for someone to grasp what I'm saying here.) It is certain that only an individual of very high status would be accorded the privilege of displaying such sacred imagery on their garments. a careful search of the literature turns up no other Wari tunics with this design. 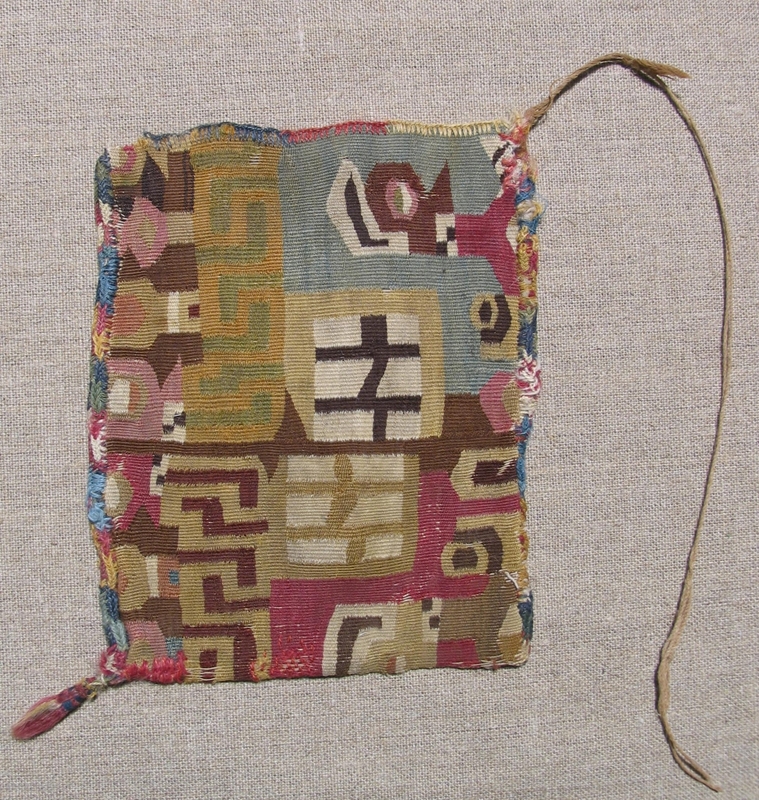 As a bag, the textile had more exposure to light on its outer side. (See images of the fabricated bag for color comparison.) Fortunately, what was once the inside of the bag still retains the remarkably vivid colors original to the weaving. 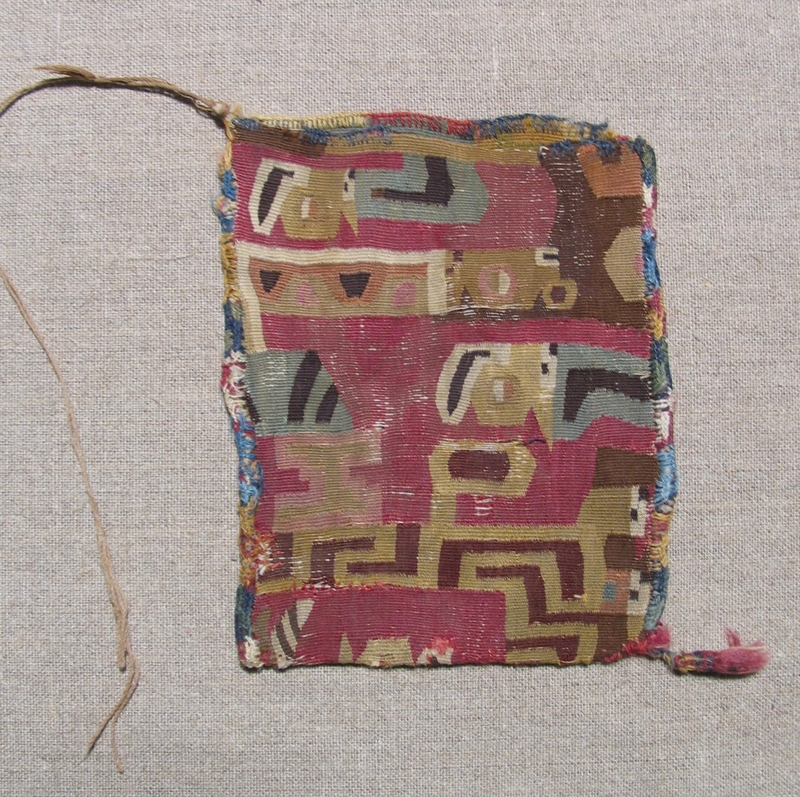 Small though it may be, this is a great Pre-Columbian tapestry fragment with first class Wari imagery. 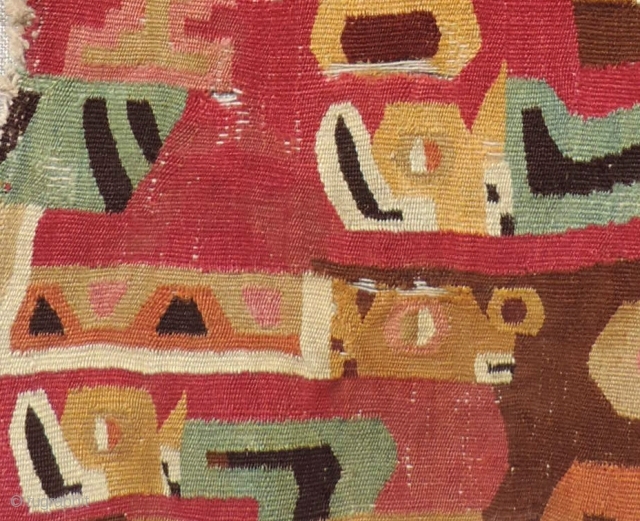 Wari tapestry textiles of this type are known to be among the finest woven fabrics ever made in the Andes. a.d. 500 - 800. Size: 5 x 12 inches. This textile awaits a careful mounting for proper display and enjoyment.